Don’t you just hate it when you have to crank your car every time you need to use it, and it has been in storage for a long time? Then each time you promise yourself not to leave it inactive for such a long time ever again, but what if you can’t help it? Maybe you’ve envisioned and prayed for a time when your diesel-powered car would start up without any problems on a frosty morning. People living in cold areas particularly know this struggle all too well. Just like any other machines, cars are meant to make life better, but if your daily morning routine involves cranking your engine by hand, it becomes a great inconvenience and a nuisance even. What is Dual Battery Starting System for Big Diesel Engine? A dual battery starting system is a set up whereby you have two batteries – a start battery and an auxiliary battery. The two are connected using a dual battery isolator. During charging, the starting battery is given priority and only after it has gotten enough charge does the isolator connect to the auxiliary battery such that both batteries are connected. This way, alternator charge can then flow into the auxiliary battery via the start battery. The reason for having two batteries is because the start battery, just as the name suggests, is designed in such a way that it is used for high cranking of the engine. The auxiliary battery, on the other hand, comes in handy when you need to run a refrigerator, camp lighting, and any other such tasks. Operations such as charging of phones, the GPS navigation, and car interior lighting operate when the car is running and as such, these are connected to the start battery since it is being charged as the engine runs and so won’t get discharged while running the aforementioned functions. Why is Dual Batter Important for Big Diesel Engine? 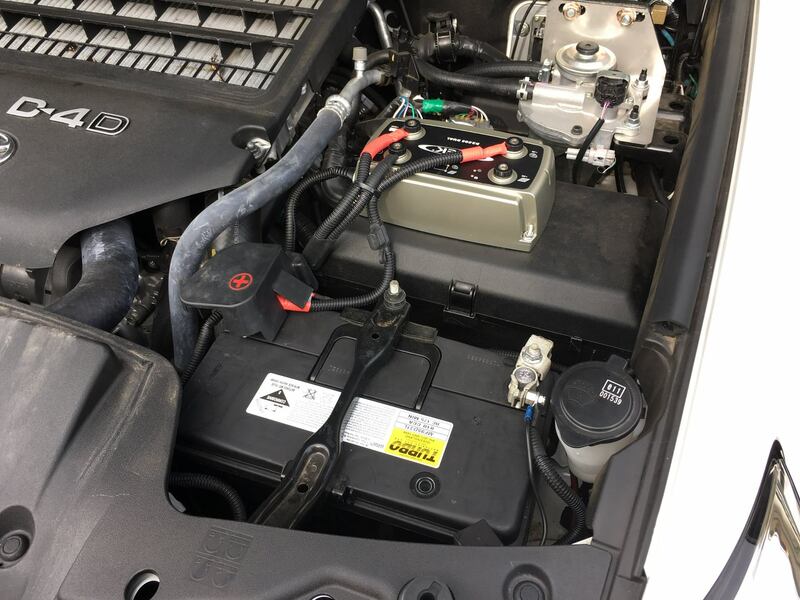 The major advantage of a dual battery system is that it protects the primary/start battery from discharging to the point whereby the engine cannot start. This way, with a dual battery system you need not worry about having to crank your battery after it has been in storage for too long because the chances are that the start battery would probably not have discharged during this time of storage. The other advantage of the dual battery system is that it provides a 12v supply point, which is the auxiliary battery, allowing you to run certain accessories when you are out camping. Such include connecting auxiliary sockets for charging radios, lamps, computers, cameras, etc. With this kind of arrangement, you are sure the car will start with no problems even after an entire night of listening to the radio connected to the power socket drawing from the auxiliary battery. Whether in the case of a vehicle or a boat, at times you may inevitably have to store it for extended periods of time. During this duration, how do you make sure that your battery is still protected? If possible, make an effort to start the car ever two weeks or so and drive around for a while even. Disconnect the battery cable connected to the batteries negative node. Consider investing in a trickle charger which essentially charges the car battery from a wall outlet. Maintain room temperatures. Avoid storing the battery in very hot or freezing conditions. New battery models have plastic cases which prevent discharge caused by damp concrete floors. If your battery is not this kind, though, you might want to place the battery atop a wooden block instead of having it rest directly on the concrete floor. Appropriate storage measures will not only maintain the quality of the battery but also eliminate the trouble of having to crank the engine every time your car is coming out of long-term storage.